Relationships after Manceau et al. 1999, Pidancier et al. 2006, and Kazanskaya et a. 2007. Hartl, G. B., H. Burger, R. Willing, and F. Suchentrunk. 1990. On the biochemical systematics of the Caprini and Rupicaprini. Biochem. Syst. Ecol. 18:175–182. Kazanskaya, E. Y., M. V. Kuznetsova, and A. A. Danilkin. 2007. Phylogenetic reconstructions in the genus Capra (Bovidae, Artiodactyla) based on the mitochondrial DNA analysis. Russian Journal of Genetics 43(2):181-189. Manceau, V., L. Despres, J. Bouvet, and P. Taberlet. 1999. Systematics of the genus Capra inferred from mitochondrial DNA sequence data. Molecular Phylogenetics and Evolution 13:504-510. Pidancier, N., S. Jordan, G. Luikart and P. Taberlet. 2006. Evolutionary history of the genus Capra (Mammalia, Artiodactyla): Discordance between mitochondrial DNA and Y-chromosome phylogenies. Molecular Phylogenetics and Evolution 40(3):739-749. Porter, V. 1996. Goats of the World. Farming Press, Ipswich, UK. Ropiquet, A. and A. Hassanin. 2006. Hybrid origin of the Pliocene ancestor of wild goats. Molecular Phylogenetics and Evolution 41(2):395-404. Schaller, G. B. 1977. Mountain Monarchs: Wild Sheep and Goats of the Himalaya. University of Chicago Press, Chicago. Shackleton, D. M. 1997. 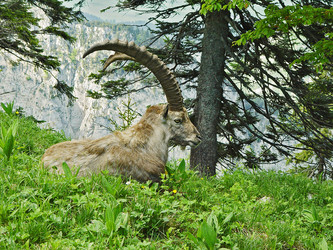 Wild Sheep and Goats and their Relatives: Status Survey and Conservation Action Plan for Caprinae. IUCN, Gland, Switzerland. Valdez, R. 1985. Lords of the Pinnacles. 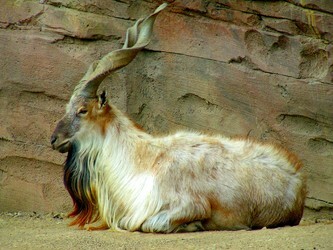 Wild Goats of the World. Wild Sheep and Goat Council, Messila, New Mexico. Page: Tree of Life Capra. Goats. The TEXT of this page is licensed under the Creative Commons Attribution-NonCommercial License - Version 3.0. Note that images and other media featured on this page are each governed by their own license, and they may or may not be available for reuse. Click on an image or a media link to access the media data window, which provides the relevant licensing information. For the general terms and conditions of ToL material reuse and redistribution, please see the Tree of Life Copyright Policies.